Descriptive analytics: This reporting tells the story of what’s been happening, such as how much inventory was sold of a certain product, or how many calls came into the contact center between noon and the end of the day. Prescriptive analytics: These reports tell what should be done. Prescriptive analytics tell a company that they need to stock more of a particular product in late summer because it is increasingly in demand by school teachers. Predictive analytics: This reporting anticipates what will happen based on descriptive data. If a customer has called your customer service line four times over four months to complain about an invoicing problem, predictive analytics recognizes the call number and anticipates what the customer will be calling to address. 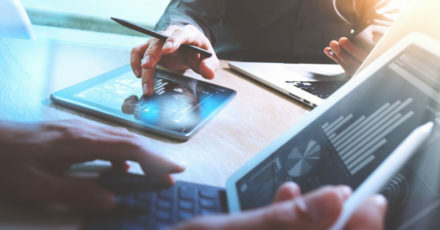 Generally, any department within an enterprise could have a demand for various types of data analytics, but much of what is driving digital transformation is the desire to harness insights for a better customer or end-user experience. For instance, a company’s sales team using a customer relationship management solution can use the data analytics from that system to better understand potential customers. They can identify the problems a potential customer may be trying to solve, based on data gathered about why current customers use a certain product. All types of enterprises across any industry benefit from data analytics and the introduction of a digital transformation plan. From determining the amount of ingredients to purchase for an assembly line at a bakery to anticipating when a piece of machinery may fail, data analytics save time, resources and costs. It’s important to note that while many benefits stem from utilizing data analytics, there are risks as well. Many enterprises have invested heavily in data collection and storage, and even take the step of analyzing the data. Some fall short when it’s time to put the data to action and improve productivity or create cost-saving innovations. Data is only valuable when it is mobilized for the enterprise. Real-time data can be particularly helpful in situations like assembly lines, where it can be used to improve quality control and address efficiency issues. If you’re initiating a digital transformation strategy, contact us at Truth Comm. We can help you prioritize your decisions related to cloud migration and IoT investments, as well as create the right framework for data analysis that better informs your decision makers.